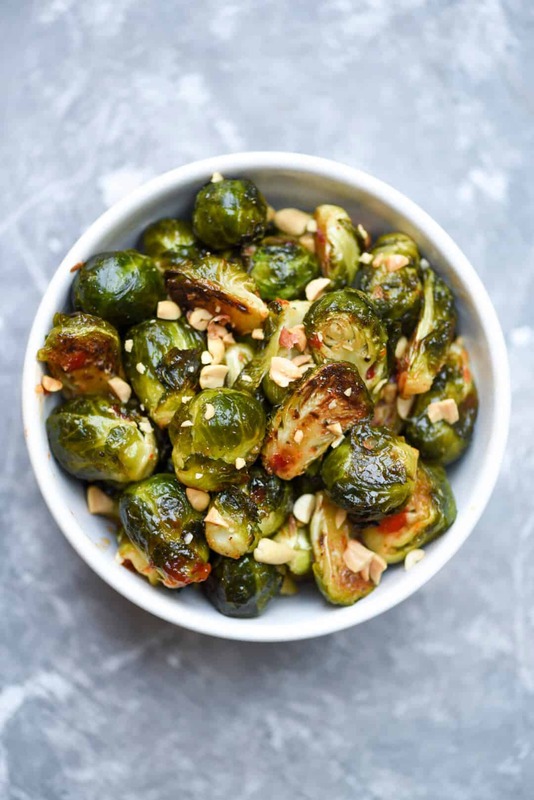 Inspired by a dish at a local restaurant, these Sweet Chili Garlic Roasted Brussels Sprouts are a unique and seriously delicious way to prepare this fall and winter vegetable. Our little town is expanding. Okay, so maybe Silicon Valley is not exactly a small town but the changes that have taken place in these parts over the past few years is pretty astounding. We live about a 10 minute drive from the brand new Apple “spaceship” campus and just a little bit further from Facebook and Google and a slew of other tech companies, start-ups, and the like. As an off-shoot to the new HUGE Apple development, we’ve got this cool new downtown Cupertino area that we are loving! It’s filled with fun restaurants, a Philz Coffee (that is some serious coffee, beware), an Oren’s Hummus Shop that sells fresh made hummus (that I swear must have something illegal in it to taste that good) along with fresh baked pita that is insanely good. Okay, I’m straying. Food does that to me. One of our favorites of the new restaurants is a place called Eureka. 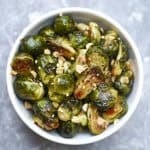 It’s a fancy burger joint with a full craft beer and small batch whiskey bar and one of items we order almost every time we go are their Crispy Glazed Brussels Sprouts. 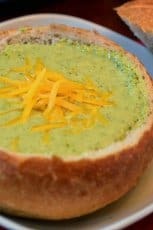 They were the inspiration for this super simple but incredibly tasty recipe. I’m very sure that Eureka’s recipe is a bit more complex but I’m telling you, this easy recipe works. Really, really well. A quick note about Brussels sprouts. You’ll typically find them available in bulk but to make things extremely easy, I like to pick up a 2 pound bag. They come trimmed, washed, and ready to go. Both of the above sprouts came from the same bag and as you can see, they can vary quite a bit in size. 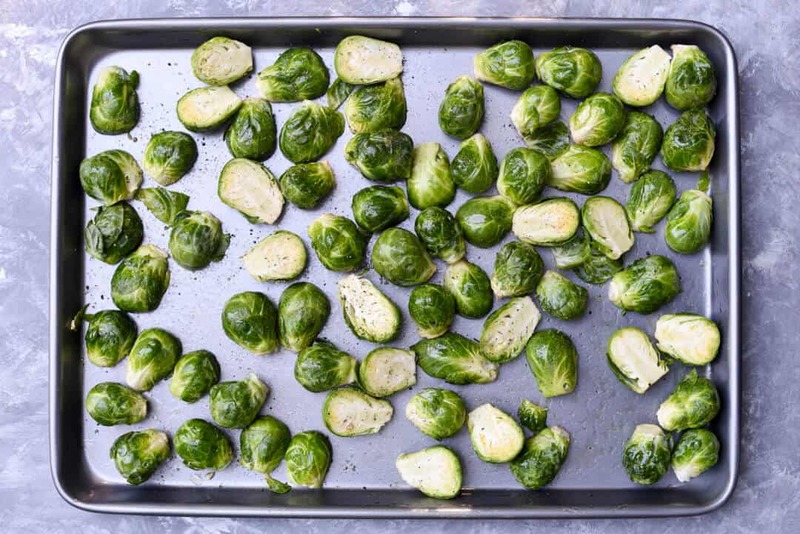 You’ll need to slice the larger sprouts in half (top to bottom) to ensure even roasting. 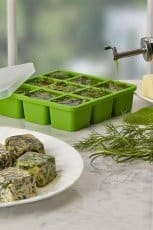 Spread them out onto a large, rimmed baking sheet and drizzle them with olive oil. Sprinkle them with a little granulated garlic (or garlic powder) and freshly ground black pepper. 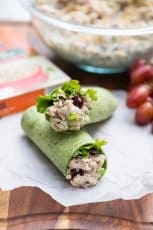 Pop the baking sheet in a preheated 425 degree oven and roast them just until tender. 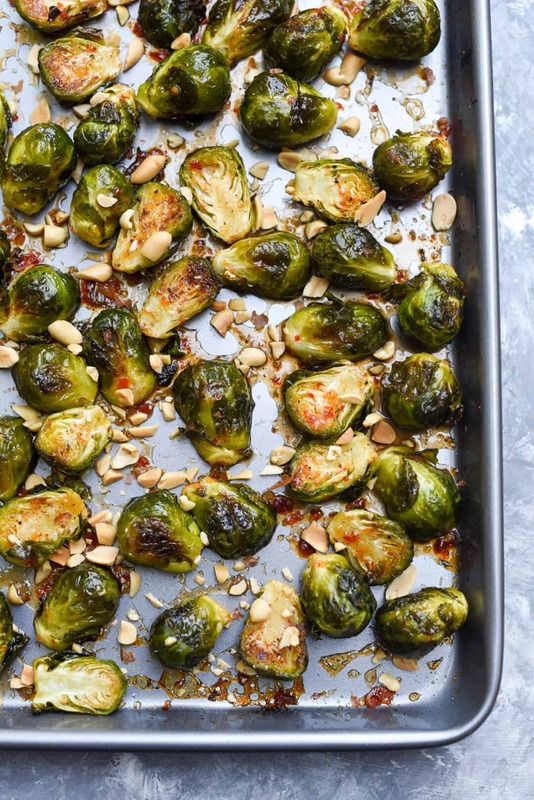 Pull the baking sheet out of the oven and drizzle the sprouts with some Sweet Chili Sauce. This sauce is widely available now at grocery stores. I’ve used the Mae Ploy brand but even Frank’s Red Hot has a version now. The stuff is magical. The baking sheet goes back in the oven for just a few more minutes to lightly caramelize that wonderfully sweet, sticky sauce. 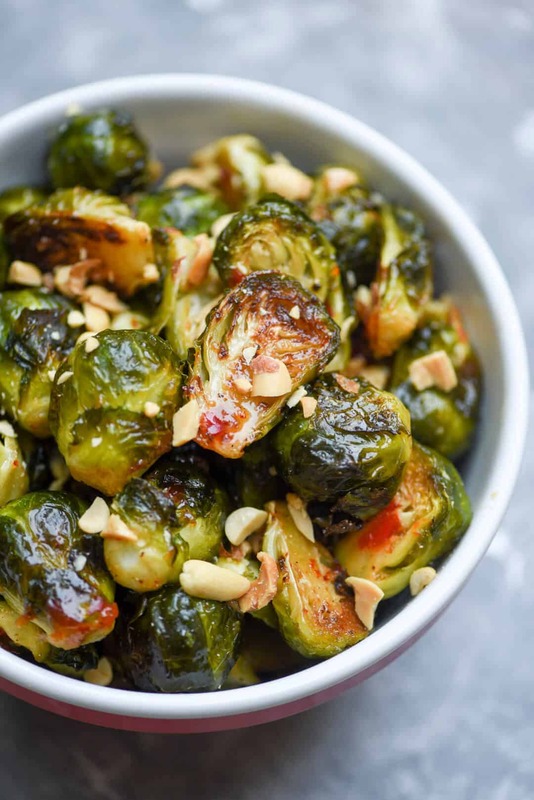 Sprinkle the roasted sprouts with some chopped peanuts and they are ready to serve. 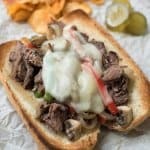 So quick and easy they can easily be whipped up to go along with dinner any night of the week. 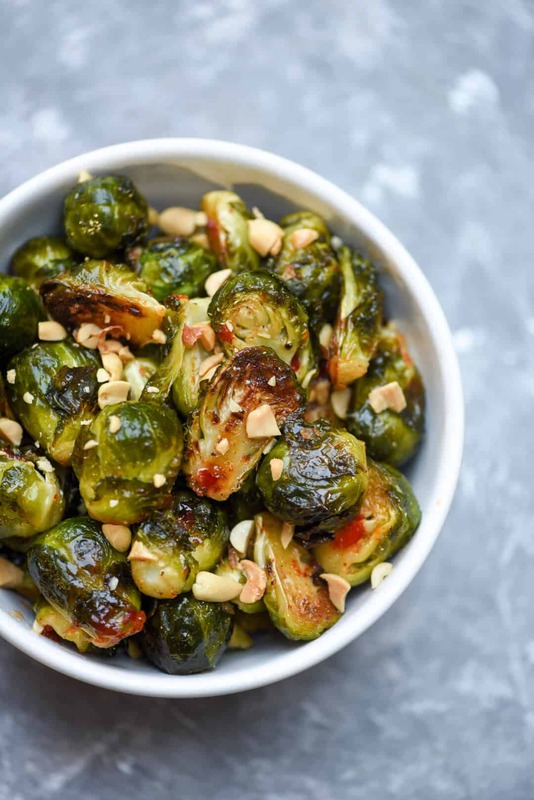 These are not your typical fall-inspired sprouts. 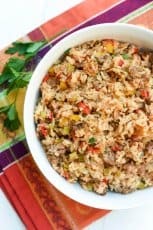 The flavors are a complete departure from any other recipe I’ve tried and they are tasty, versatile side dish. Try them! Rinse and drain the brussels sprouts. Trim tough ends, if necessary. To ensure even roasting, slice larger sprouts in half from top to bottom and if they are very large they can be quartered. 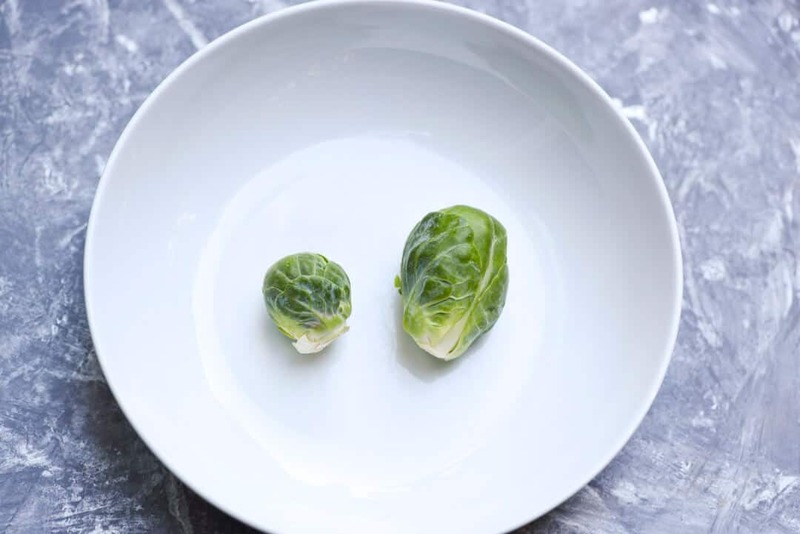 Smaller sprouts can stay whole. 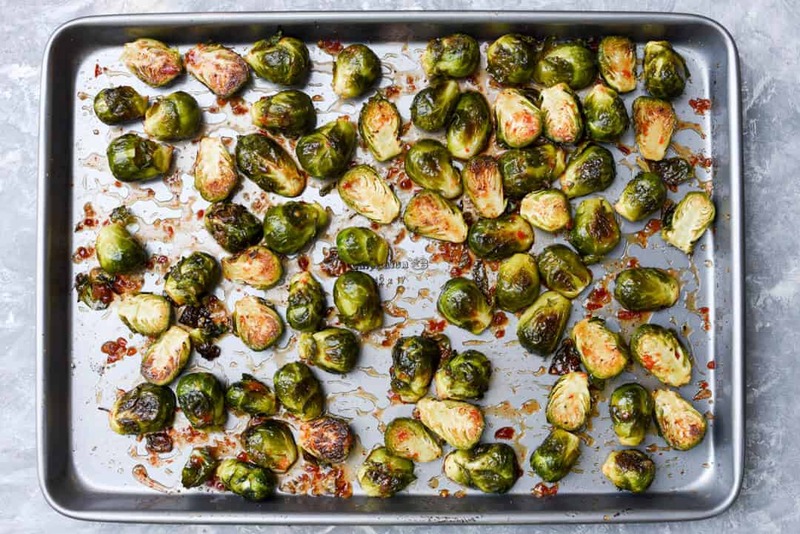 Place sprouts on a 12"x 16" rimmed baking sheet. Drizzle with olive oil and sprinkle with granulated garlic and pepper. Stir to coat evenly and place baking sheet in the oven. Roast for 10 to 20 minutes (time will depend on size of your sprouts). 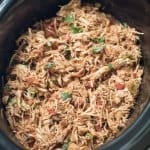 Stir once or twice through the cooking time to ensure even browning. When tender when pierced with the tip of sharp knife, pull the baking sheet out of the oven. 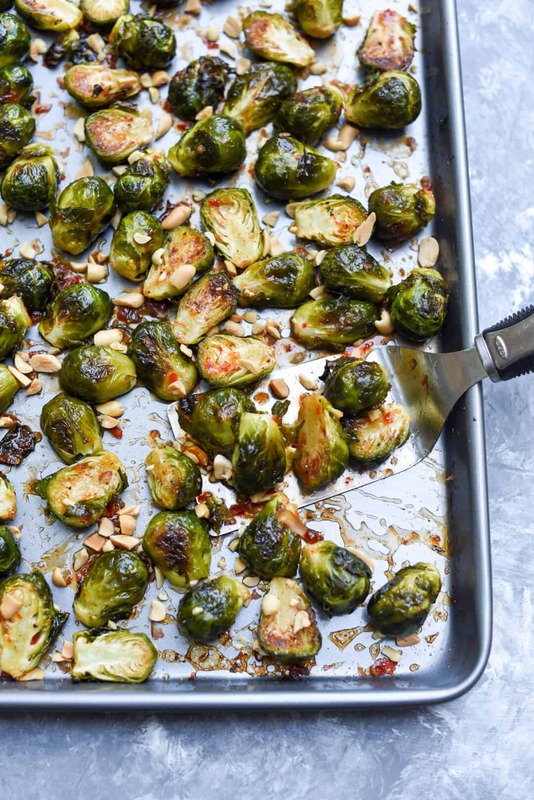 Pour sweet chili sauce over the sprouts and use a spatula to toss and combine well. 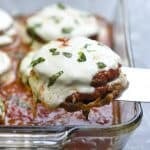 Return to the oven and roast for an additional 3 minutes to thicken and caramelize the sauce. 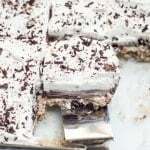 Sprinkle with chopped peanuts before serving. 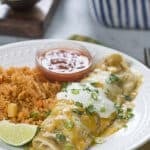 There is so much flavor in the sauce that I don't feel the need to add any salt to this recipe. Taste and season according to your own taste. 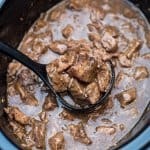 International Can-It-Forward Day and a Ball Canning Prize Pack Giveaway!